Everything about the Emmys is wonderful and exciting, but let’s face it — that’s a long evening of awards, and it’s no surprise that the audience might get a little hungry. The team planned for that though, and Entertainment Weekly reports that Jimmy Kimmel’s mom Joan made thousands (literally) of delicious peanut butter and jelly sandwiches! OMG, what a sweetheart. 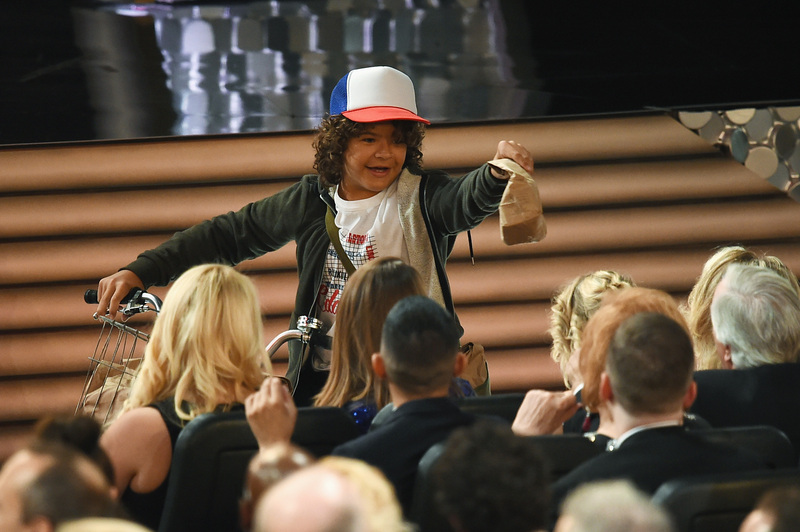 And as if that wasn’t amazing enough, these yummy snacks were given out on bicycles by the kids from Stranger Things: Millie Bobby Brown, Gaten Matarazzo, and Caleb McLaughlin!!! Knowing that nut and gluten allergies are common, Kimmel notified the audience ahead of time that these goodie bags contained both ingredients (while also, of course, poking fun at celebrities with gluten and nut allergies). And by the looks of things, people were pretty happy with their sandwiches! Who wouldn’t be?! Joan even left a special note for Jimmy inside his lunch bag, and we are loving this so much right now. He didn’t win, but we’re pretty sure he had fun. Okay, are you ready to witness how this amazing-ness unfolded? We wished we were at the Emmys before, but this really seals the deal. Maybe next year will finally be our year! (Okay, probably not. But it’s definitely going up on our vision board). Oh, and is it just us, or is everybody else suddenly in the mood for a PB+J?